Crystal has been 3D-printed into vases, upcycled into terrazzo and channelled into solar panels by the three winners of the Swarovski Designers of the Future awards for 2017. TAKT Project, Jimenez Lai and Marjan van Aubel are the recipients of this year's awards, which recognise up-and-coming designers and give them the opportunity to devise a new installation for Design Miami/Basel. This year the three emerging designers have combined their projects into a single installation, revealed today as the collectible design fair got underway in Basel. 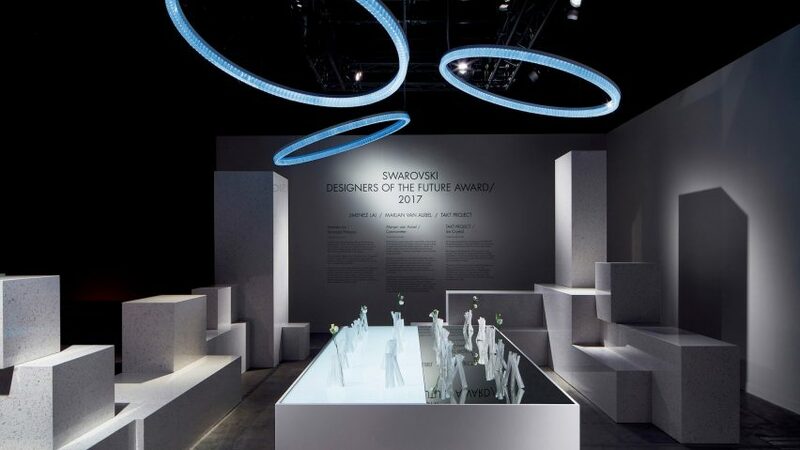 Since Swarovski became the awards sponsor in 2015, the entrants have had to work with crystal as a material while demonstrating an "innovative approach to design and pioneering use of new technologies". This year that has translated to a focus on 3D printing, recycling and renewable energy. Lai, founder of the LA-based studio Bureau Spectacular, recycled rejected second-quality crystal to create his project, Terrazzo Palazzo. This crystal contains minor imperfections that makes them unusable in Swarovski's usual pieces, although the flaws are said to be so small they're invisible to the naked eye. Lai used the crystal to make a terrazzo tile, manufactured in Italy with the help of Brent Dzekciorius from Dzek, which is used to form plinth-like geometric structures in the Miami/Basel installation. Lai even developed different colours of tile – one to match each of the Designers of the Future. Japanese studio TAKT Project, which was started in 2011 by former Nendo employee Satoshi Yoshiizumi, explored the 3D printing of crystal for its project. The studio worked with the Tel Aviv-based company Micron3DP, which claims to have been the first to do high-resolution 3D-printed glass (Swarovski crystals are essentially a high-quality lead glass). TAKT Project used this process to create the Printed Crystal series of candleholders and vases, which have a delicate, ribbed texture that the studio says is not possible to achieve with traditional techniques like glass moulding, blowing or cutting. The forms are inspired by frost crystals with walls that are just 1.5-millimetre thick. "By printing crystal we can in effect print light, a new way of thinking that will be part of shaping societies in the future," said the studio. The third designer recognised by this year's awards is Van Aubel, a Dutch practitioner who works with solar panels, and has previously integrated them into windows and tables. She began her project by integrating a solar cell within a crystal, which she says enhances the capabilities of the cell by helping to direct light into it. This is a small cell that is designed to portable, carried around by a user during the day and then used at night to power light sources within their home. To translate the gadget into interesting objects for the installation, Van Aubel produced Cyanometer, a series of three "living light objects" that look like giant hooped pendants. Named after a device for measuring the "blueness" of the sky, the lights combine Swarovski crystals with LEDs to mirror the changing colours of the sky throughout the day. They are powered by energy gathered through Van Aubel's crystal solar cell. All three projects loosely respond to this years Designers of the Future award theme of Shaping Society. The installation will be on display at Design Miami/Basel until 13 June.